Bagsvaerd Churchis a Lutheran church designed by Jørn Utzon completed in 1976. 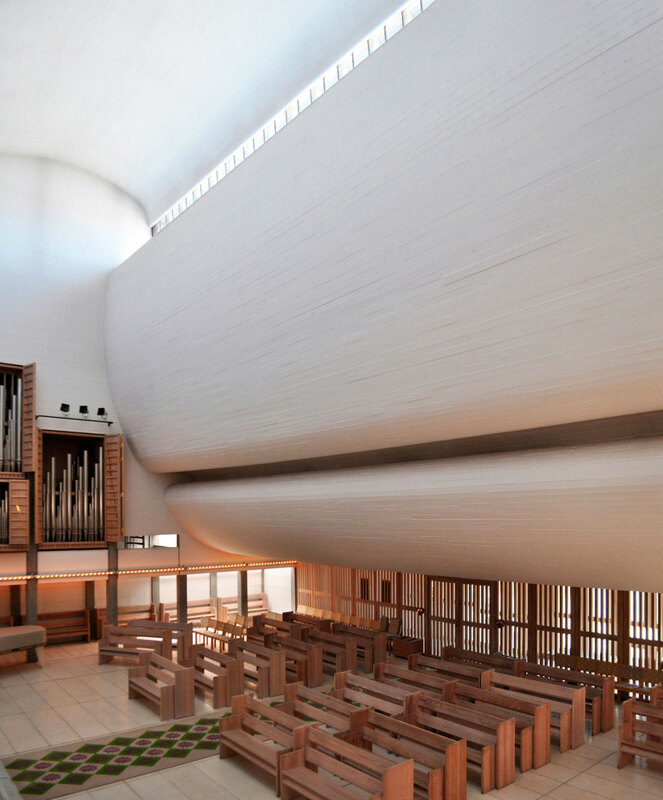 The project is a masterpiece of contemporary church architecture, characterized by a white concrete ceiling straddled with softly rounded vaulting that modulates the bright interior lighting. There is a rumour that I can’t draw and never could. This is probably because I work so much with models. Models are one of the most beautiful design tools, but I still do the finest drawings you can imagine. 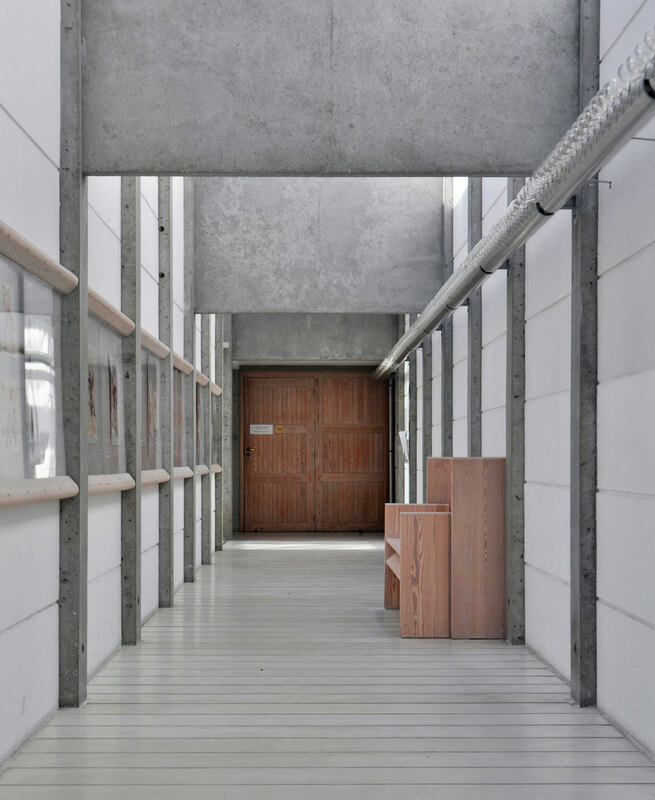 Located on a narrow plot in a suburban setting, the building itself is narrow, and has an austere façade which encloses the various rooms and a number of small courtyards. 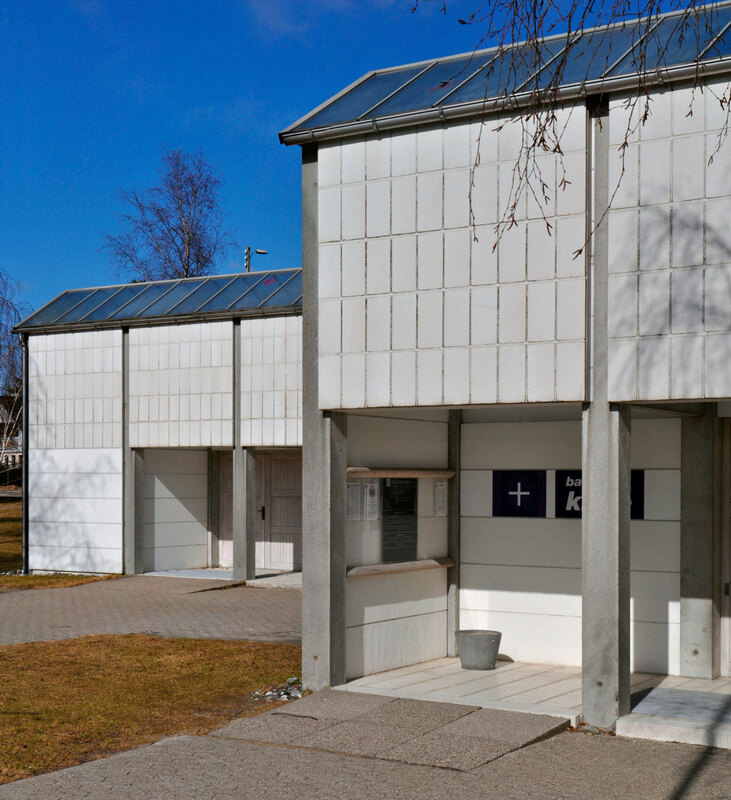 Surrounded by birch trees, the exterior walls are faced with white prefabricated concrete panels and white glazed tiles. The aluminium roof gives the church a rather industrial look. Glass sections provide lighting over the connecting corridors. Covering an area of 1,700 square meters, the tight geometrical plan consists of three sections and a courtyard between two parallel corridors. 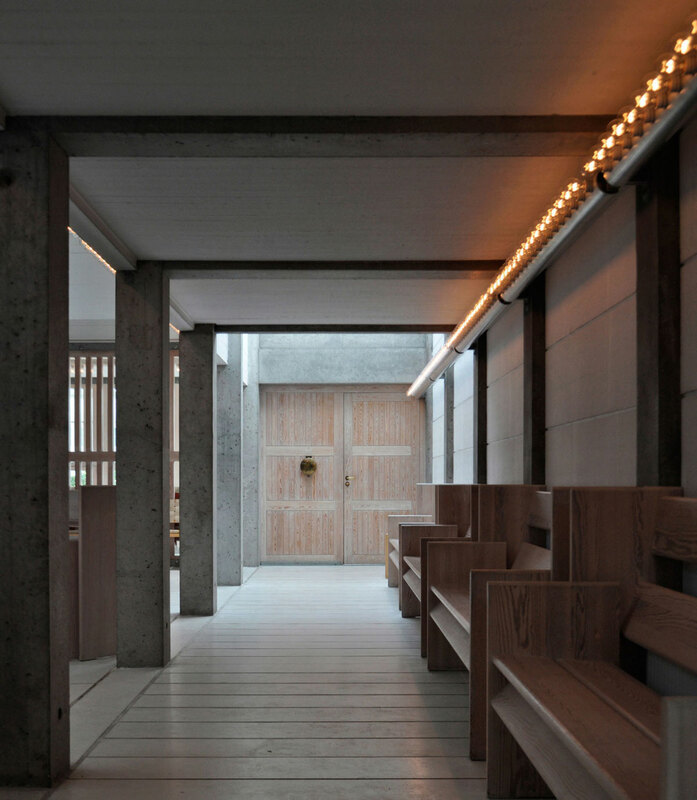 The rectilinear, modular structure of the building and its integrated courtyards, as well as the connecting corridors, are said to be inspired by the design of Buddhist temples in China. The interior includes the nave and sacristy, offices, rooms for confirmation classes, a meeting room, and a whole section for youth activities. 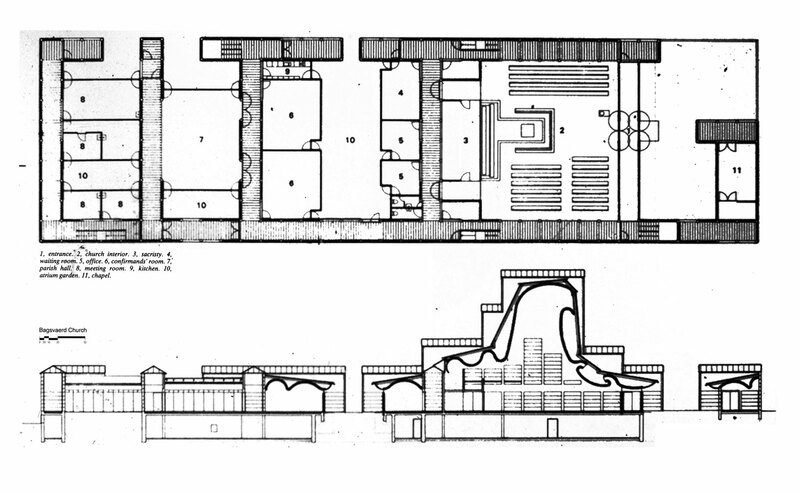 They are all linked by wide corridors which run both through the building and along the external walls where they are illuminated by skylights. 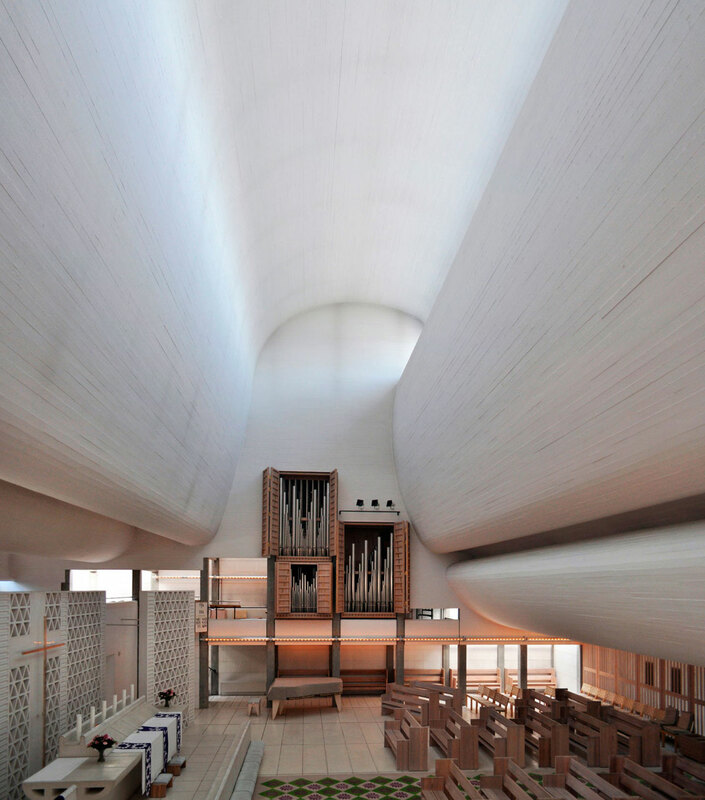 The vaulted ceiling is made of reinforced concrete shells, only 12 centimetres thick and spanning 17 metres. The curved cylindrical shells rest on flanges supported by rows of double columns which act as flying buttresses. The inspiration that I derived from the drifting clouds above the sea and the shore [forming] a wondrous space in which the light fell through the ceiling — the clouds — down on to the floor represented by the shore and the sea. 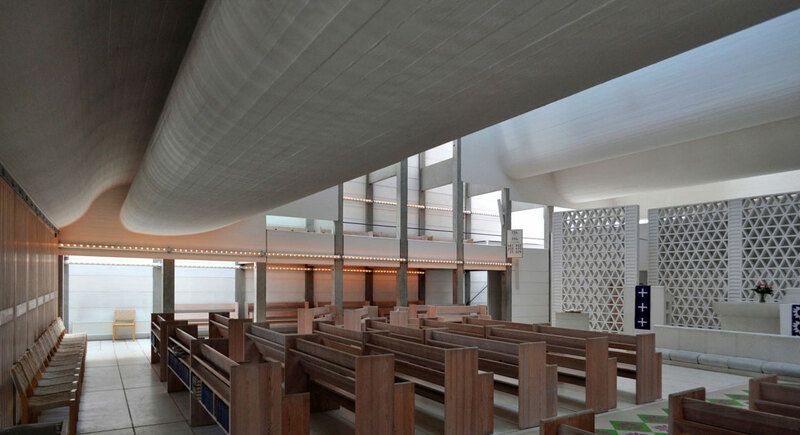 Cite this article: "Bagsvaerd Church / Jørn Utzon," in ArchEyes, April 10, 2016, http://archeyes.com/bagsvaerd-church-jorn-utzon/.